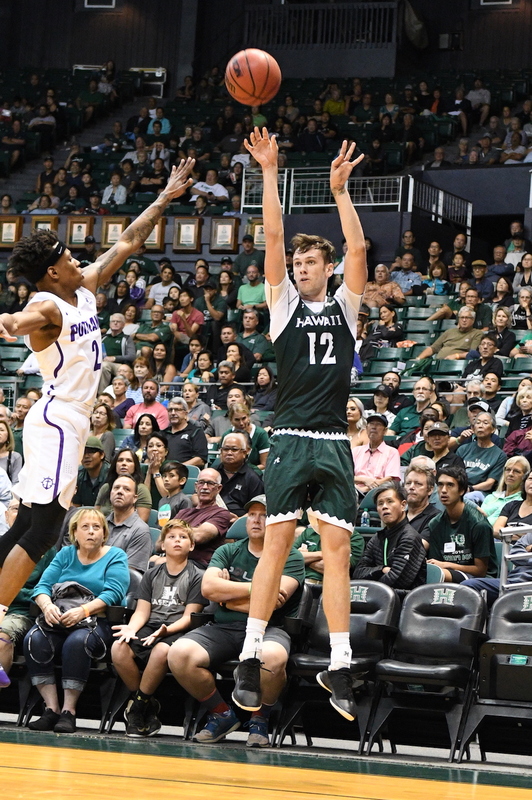 Using its touted depth to help find its true identity in the second half, the University of Hawai’i men’s basketball team soared past Portland, 82-64, Friday night in its season opener on Day 1 of the Outrigger Resorts Rainbow Classic. An appreciative crowd of about 3,400 at the Stan Sheriff Center watched Zigmars Raimo score 17 points and grab eight rebounds and Brocke Stepteau add 16 points and four assists to lead the Warriors, who will host Humboldt State at 7 p.m. Saturday on Day 2 of the Classic. Jack Purchase contributed 15 points and five assists, and Eddie Stansberry added 12 points and four boards and Samuta Avea 10 points and seven rebounds off the bench. Former Maryknoll High School student Marcus Shaver, Jr., scored a game-high 19 points to lead the Pilots, who fell to 1-1. Raimo scored on a layup at the halftime buzzer to give UH a 36-34 lead at the break, and the Warriors opened the second half with a 17-3 run capped by Stepteau’s 3-pointer from the top of the key to put the them ahead, 53-37, with 13:32 remaining. 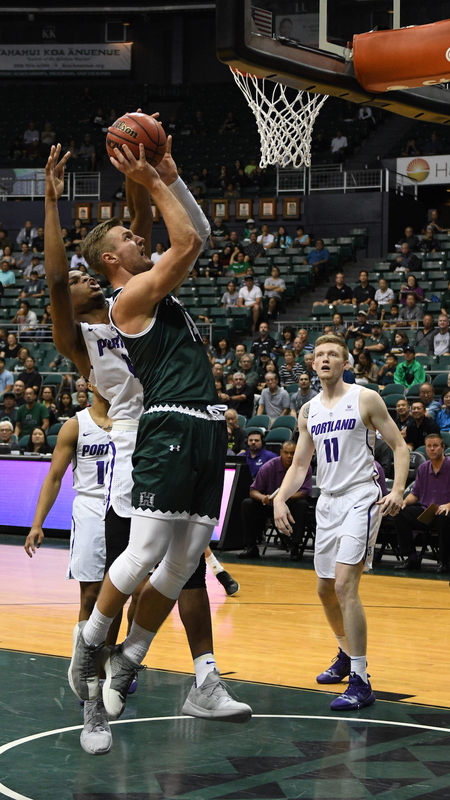 Hawai’i later extended the lead to 69-50 on Purchase’s 3-pointer from the right wing with 6:04 left, and Portland could not get closer than 11 points the rest of the way. After UH took a 3-0 lead in the first 90 seconds, the Pilots stormed back for a 13-2 surge capped by JoJo Walker’s steal and breakaway layup five minutes after tipoff. The Warriors rallied back to eventually tie it at 15-15 on Stansberry’s 3-pointer from the right corner three minutes later, and they took the lead back at 23-22 on Raimo’s layup with 7:45 remaining. 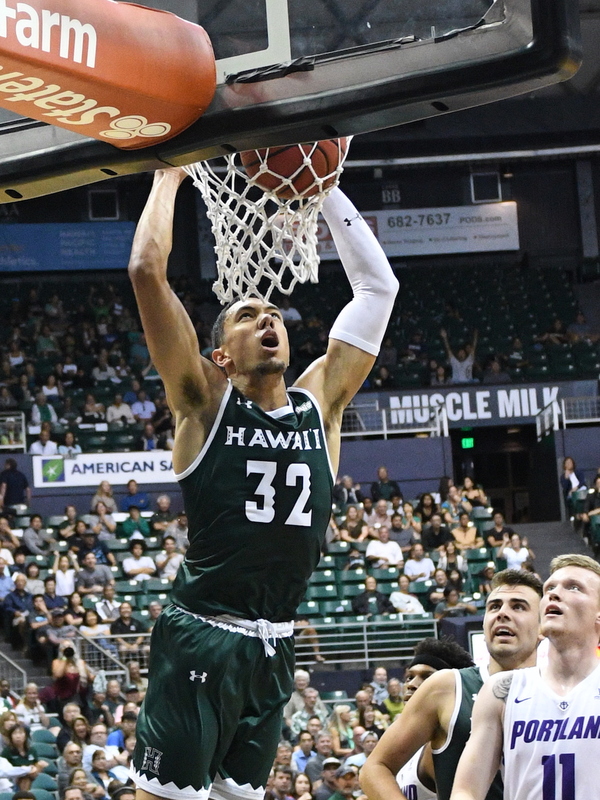 With just under four minutes left, Avea came flying in for breathtaking blocked shot and then finished at the other end with a two-hand slam dunk off Raimo’s assist, and then Stepteau drained a deep 3-pointer from past the top of the key to put Hawai’i ahead, 34-24, at the 3:25 mark. “I was just doing my job — that’s my position, to help on the big when he rolls, so I just made a play and then ran the floor like I was supposed to,” Avea said. Portland then responded with a 10-0 run capped by Walker’s steal and perfect downcourt bounce pass to Shaver for a fast break layup to tie it at 34-34 with 30 seconds left. Raimo’s buzzer-beating basket after Stepteau’s drive-and-dish ultimately gave the Warriors the lead for good, but it took a pointed halftime discussion to make it so. Stepteau started the 17-3 surge with a floater 70 seconds into the second half, and Purchase highlighted it with two 3-pointers sandwiched around a 15-foot turnaround jumper from his high post spot near the right elbow. After Stansberry’s 3-pointer opened the lead to 65-46 with 7:34 remaining, the Pilots made one final run to close it to 69-58 on Malcom Porter’s free throw at the 3:25 mark. But Raimo answered with a layup off of Brandon Thomas’ assist to ignite a 7-1 surge capped by Buggs layup to effectively seal the victory with a 76-59 lead and only 2:11 left. Portland made 4 of 10 shots from 3-point range in the first half, but just 1 of 7 in the second. Offensively, the Warriors received 27 points off the bench, which was big considering returning starter Sheriff Drammeh remains sideline with a nagging injury. Looks like we got a pretty solid team this year! Had some lapses but recovered well.